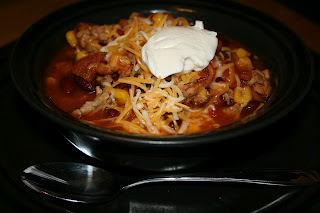 This classic recipe is simple and hearty, from “A Year of Slow Cooking” by Stephanie O’Dea (crockpot365.blogspot.com). Stephanie O'Dea's Taco Soup from "A Year of Slow Cooking"
Brown meat; drain fat and add meat to crockpot. Sprinkle seasoning packets on top of meat. Drain and rinse the beans and add. Add the entire contents of the corn and tomato cans. Stir together. Cover and cook on low for 8-10 hours or on high for 4-5. The longer you cook it, the better! Embellish (cheese, sour cream).